Health Games: A Fun way to a healthy YOU! The proliferation of information technology in the last decade in the realm of healthcare delivery signifies a disruptive change in the way healthcare businesses are organized and care is delivered. Increasing investments in healthcare IT (HIT), the passing of the Health Information Technology for Economic and Clinical Health Act (HITECH), and the successful defense of the Affordable Care Act (ACA) in the Supreme Court all contributed to the implementation and reliance on healthcare IT. The fast-paced change in the US healthcare landscape has led to various meetings of leaders of healthcare innovation like the 4th Annual Innovation Centers Summit in Newport Beach, hosted by The Innovation Institute and Blueprint Healthcare IT. Approximately 50 attendees from across the spectrum of healthcare innovation, from large commercial groups such as NorthShore-LIJ to academic biomedical research centers from Johns Hopkins. I attended on behalf of the Center for Health Information and Decision Systems, a center of excellence at the Robert H. Smith School of Business, University of Maryland, that works in collaboration with industry and government affiliates to research, analyze, and recommend solutions to challenges surrounding the introduction and integration of information and decision technologies into the healthcare system. During the Summit meeting of intellectuals, practitioners, and entrepreneurs, the prominent discussion revolved around incubating and nurturing early ideas to full blown commercial success. Youseph Yazdi of Johns Hopkins CBID lectured on the importance to have a cyclical cycle of discovery, improvement, and stakeholder engagement in the area of biomedical development. Katherine Steinberg of the UCLA Institute for Innovation in Health expounded on the importance to have a uniform and fair process checklist for the criteria of project selection. Of particular interest is the structure and framework NorthShore-LIJ’s group of internal entrepreneurs, North Shore Ventures. Sander Duncan of North Shore Ventures explained how NorthShore-LIJ leveraged their vast corporate resources and sheer number of employees to “mine” innovation. They built up a framework of innovation from sourcing to commercializing ideas. They have standing committees of stakeholders and physician partners to contribute feedback and improve solutions. A team of lawyers and a set of tailored legal documents are ready to go, reducing overhead cost to incubate a new idea. All the frameworks and projects discussed by the various centers and entrepreneurs at the Innovation Centers Summit revolved around reducing cost and expanding access, the most significant issues in healthcare today. Problems in the U.S. healthcare, like limited access and high cost, are not recent discoveries. However, the growing adoption of healthcare IT gives the industry a unique opportunity to affect positive change in the form of new care delivery models and new decision-making tools by leveraging the growing volume of data and the ubiquity of electronic devices in the healthcare space. For example: consumer wearable devices are increasingly adopting health, fitness, and wellness features; large-scale data mining in acute, ambulatory, and even the longitudinal records are helping to treat chronic conditions before they become acute. Amongst the entrepreneurially spirited at the summit, there was discussion on the efficacy of placing health services “kiosks” are high trafficked locations, like the mall, in a bid to improve access. It is clear that the future direction of healthcare is providing easier access to care services outside of the clinic and hospital. Coincidentally, at around the same time of the summit, Kaiser Permanente, the largest HMO in the U.S., announced a partnership with Target Corporation, piloting Nurse Practitioner-run clinics at five Target retail stores in California. The industry is moving to a longitudinal care model to support the lowering of healthcare costs and improving access. The recent changes in incentives are part of the drivers of this change. Healthcare innovation groups need to have solid legal and corporate support in order to successfully grow an innovate idea to commercial success. Social benefit should be broken down to the financial gain by direct revenues or financial proxy. The firms with the most resources to pursue innovation development are those firms which are more lean than not, and require the hard numbers. Engage with the entrepreneurial providers and have them be on-call to contribute and support the cause. There are still significant barriers in healthcare to the business/”financial” way of doing things. But this barrier is being diminished as more of the successes in healthcare following more business-focused principles, e.g. lean. Chun Wong is a first year MBA student at the Smith School of Business with a focus in Healthcare Information Systems. Chun holds a Bachelor of Science in Bioengineering from Binghamton University. He previously worked at Epic, an electronic health records vendor, managing technical analysts and partnering with customers to improve their deployments. He is interested in leveraging innovations in health IT to reduce provider workload, improve patient outcomes, and boost patient engagement. Specifically, the available volume of underutilized healthcare data embodies great potential care benefits. Chun hopes to work on projects that commercializes IT capabilities and innovations in the domain of healthcare delivery. In the past two years, the Centers for Medicare and Medicaid Services (CMS) has released data containing provider charges (i.e., sticker prices) and payments for the 100 most common inpatient services and 30 common outpatients services for fiscal years 2011 and 2012. The first data release motivated numerous media reports, resulting in headlines like “New hospital billing data is enough to make you sick“. The tone of the headlines was inspired by the variability observed in the data. The prices charged by providers vary in some cases by an order of magnitude and cannot be explained entirely by the provider location, type of service, and population demographics. Figure 1 includes examples of the distribution average provider charges for three different DRG codes that demonstrate this variability. The three different DRG codes represent an inexpensive, a moderately expensive, and an expensive procedure. Figure 1. Box-plots of providers’ average charges for three DRG codes. DRG 870 (Septicemia w MV 96+ hours)—Expensive procedure. DRG code: The code identifying the MS-DRG. MS-DRGs are a classification system that groups similar clinical conditions (diagnoses) and procedures furnished by the hospital during the stay. We created a regression model to explain average sticker prices in 2012, and consistent with researchers’ observations from the 2011 data, commonly used provider, procedure and population characteristics only explain 67.45% of the variability in the average charges. In addition, we compared the average sticker prices in 2012 with those from 2011 for the inpatient services, in order to investigate any differences in provider charging behavior. National health spending is expected to grow 5.8 percent not adjusted for inflation) per year from 2010 through 2020. For the period 2011-13, national health spending increased around 4.9 percent  annually. We expect to see, on average, the prices increase at the rate of health care inflation. This is confirmed by the study as described below. 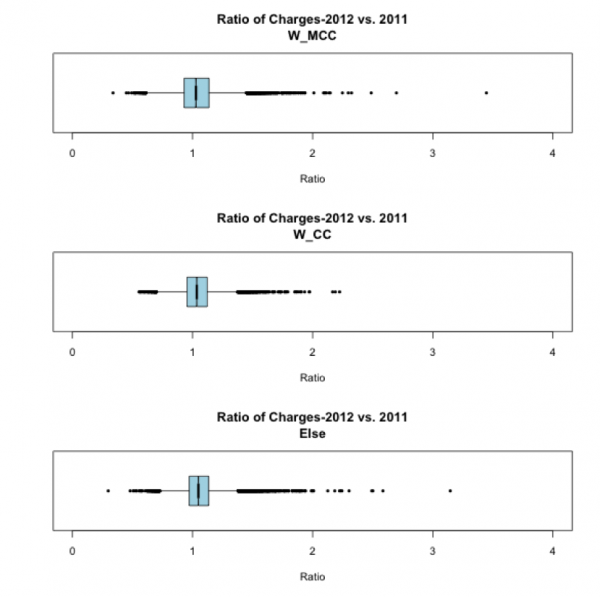 We conclude that the 2012 charge data confirms the variability observed with the initial information release. In addition the data is consistent with the observed increases in health care costs. We hypothesize that the initial information release may have had an effect on charging behavior, an effect that can possibly be observed when 2013 charge data will be released next year. 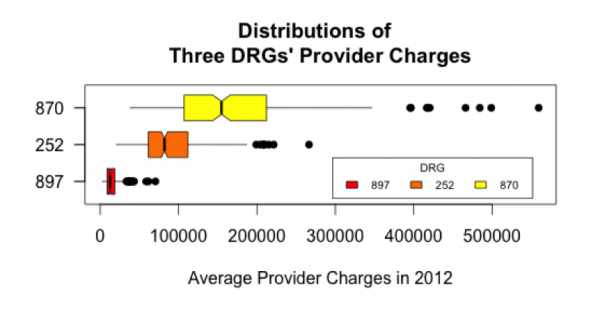 We calculated the ratio of average provider charges in 2012 to 2011, for each provider-DRG pair. We excluded records with fewer than 25 discharges billed by the provider (either year) so that our results were not overly sensitive to outliers. We summarize the distribution of the ratios in Figure 2. The ratios range from 0.29 to 3.45 and the mean is 1.052. We found that approximately 95% of our records’ ratios fall into the interval (0.695, 1.394). When we exclude the observations that fall outside this interval, the mean ratio for the new data is 1.042. Both means of ratio are close to the projected increase previously mentioned. In addition, we divided the diagnosis-related group (DRG) codes into three price-based categories: codes with major complications or comorbidities (W_MCC), codes with complications or comorbidities (W_CC), and the remaining procedure codes (Else). Figure 3 summarizes the distribution of the ratios for the three categories. The ranges and means of the ratio for the three groups are: (0.3381, 3.4460), (0.5542, 2.2250), (0.2976, 3.1460) and 1.0430, 1.0450, 1.0600 respectively. In general, the mean ratio for each category is within range of the expected inflation rate for health spending and do not show a substantial changes from the previous year. The W_MCC category has the lowest mean and the largest range. The W_CC category has the least number of outliers. We did not observe a significant change in the distribution of provider charges from the first year to the next. Figure 3. Distribution of ratios of average provider chargers in 2012 to 2011 of group W_MCC, W_CC and Else respectively. As part of my graduate assistantship at the Center for Health Information and Decision Systems (CHIDS), I have been researching vendor solutions in the market for prevention and detection of Fraud, Waste and Abuse (FWA) in healthcare billing claims, also called anomalous claims. My analysis is related to a larger effort at CHIDS to evaluate current FWA capabilities and explore future innovations in predictive modeling that may enhance the appropriate detection of anomalous claims. We are conducting this research program with our industry partner, CNSI, who has developed the ClaimsSure product, and is using innovative techniques and algorithms to combat Medicaid fraud. My analysis may help provide a reference point for the current state of the market and where it is headed. Prior to business school, I worked with a large health insurance company in the IT function supporting and developing their enrollment and claims systems on a mainframe platform. We were not using any of these FWA prevention tools that I found, and certainly not in any widespread fashion in the systems that I was working on. I was surprised that a company of that size did not have a FWA prevention tool in place. But when I started analyzing other large firms in the health insurance space, it appears that not a lot of them have a well-developed FWA prevention system in place that is leveraging advanced analytics. Most of the companies have some sort of basic fraud detection tool in place to act as a barrier to stop fraudulent claims from being processed, but the use of an advanced real-time FWA prevention tool with a dedicated team working with the solution does not appear common, or maybe they hide away this unit from public disclosures. In June 2011 the Department of Health & Human Services (HHS) and the Centers for Medicare & Medicaid Services (CMS) launched the “Fraud Prevention System,” it takes a method and strategy used by credit card companies by implementing predictive analytics to identify and prevent paying for improper claims. The primary contract for the system was awarded to Northrup Grumman though Verizon, which has a similar system to fight fraud, and IBM also has contracts for various aspects of development and implementation. CMS and WellPoint are the biggest clients for this system and are reporting benefits of having a FWA prevention and detection tool. Within the first 6 months of usage, WellPoint opened 90 investigations and achieved $27 million in projected savings. Some of the other larger companies that have developed similar systems are Verisk Health, GDIT, EMDEON, LexisNexis and SAS. The products offered by each of these companies offer to do the job of detecting and preventing fraud through different approaches. This FWA predictive analytics overall market is still in its nascent stage. These systems are being improved to help detect and prevent fraud better. An important piece of this puzzle could reside with the government. If the government aggregated and made claims data available with verified fraudulent claims flagged, it would help in the development of innovative models to fight FWA. Thanks for reading, follow this blog for updates on the FWA research at CHIDS. Was very excited to get my hands on the Fitbit Force. I have been reading, comparing and following different wearable fitness devices for a while now but this was the first one that I could get my hands upon. The order took around a month to arrive. I wonder if some people decided to choose the competitor devices because of the long wait times. However, the Fitbit being one of the latest offerings in the market, there was a good reason to wait. Upon opening the box, I was amazed to find no setup manual but a card indicating that I go to an online page to configure my fitbit. This was similar to my Jawbone Era bluetooth headset and I believe that this is the present trend for most electronic devices- either make them so easy to operate that an operating manual is not required or let people configure the device through an online manual. After setting up the fitbit application on my Macbook Air and plugging in the wireless sync dongle, I went through certain steps to setup my account and the device. I chose to login with the Facebook account- a convenient way to avoid the hassle of setting up yet another account and remembering one more password. Though the setup was easy, it wasn’t quick. Rather than showing a waiting symbol after each step, the page just froze and at first I ended up clicking the ‘Next’ more than a few times; neither a good design practice in terms of usability or operations. I was reminded of our operations management class where our Professor (Yi Xu) taught that if there is an unavoidable waiting time, the best one can do is assuage one’s clients by providing them some kind of indicator on how long they have to wait or provide them a distraction that makes the wait time appear shorter. Priceline.com for example displays a suited man ‘negotiating’ for the best available deals. Everytime I use it, I cannot avoid a quick smile of how priceline gives me a (not so transparent) view of what it is doing at the backend while I wait a few seconds. Other than the freezing screens, the setup was a breeze. However, when I was asked to clasp the band on my wrist, I had to click on ‘need help’ button to find a video on how to put the band on to my wrist securely. I couldn’t securely wear the band even after multiple attempts. I felt like a child when I went to my mom to put on the cuff buttons of my shirt. After watching the ‘how to wear video’ a few times, I could finally wear the fitbit. Overall, the device does sit comfortably on my wrist and feels like a sports watch. Next, I went through the application but was a bit disappointed that the downloaded fitbit application on my Mac did not have the dashboard and I essentially needed to go to the fitbit website to set my goals etc. In fact, the fitbit application on my desktop provided me with a link and the link challenged me for my login credentials again. At this point of time, I realized that my Mac app was only a bluetooth sync app with no other business logic built into it. The fitbit dashboard app looks good. Haven’t explored it much but I like the default goal settings and default privacy settings overall- no complaints there. Yet to explore the mobile app but being a mobile buff, I am sure I’ll be doing so very soon. Overall, a good first impression of the package. Only bit that I find cumbersome in the device design is the placement of the button. The button (and the only button on the device) on the fitbit to power on the display and the device itself is placed on the left. Being habitual to wearing watch on my left hand, it is a little cumbersome to reach out to the left-side to power on the display. Maybe, fitbit should offer a left-handed and a right-handed option- may not be feasible from a design perspective or from manufacturing perspective. Nonetheless, they should give it some serious thought while designing to make their next product ambidextrous. My Graduate Assistant work at CHIDS introduced me to the world of health games. As I research more about health games and their application to the world of diabetes – specifically Type 2 Diabetes, I am getting more intrigued by them. How can games – video games or some other simple games say trivia help people manage their diabetic condition better? Before we jump into the games – let me explain a bit about Diabetes. Diabetes is a group of metabolic diseases in which a person has high blood sugar, either because the pancreas does not produce enough insulin, or because cells do not respond to the insulin that is produced. Today there are 25.8 million diabetics in US alone or roughly 8% of the population and its prevalence is growing. It’s broadly categorized as Type 1 Diabetes and Type 2 diabetes. Type 1 diabetes is mainly hereditary while type 2 diabetes is more of a lifestyle disease. A few of the causes of Type 2 Diabetes include obesity, lack of physical activity, poor diet, stress and urbanization. Resonates with your day to day living? That’s exactly where health games come into picture. Today all of the age groups are running after their goals and in the process are neglecting their health. The definition of relaxation is no longer a game of football or running, but it has changed to video games and television. Add to it the colas and pizzas that come along with this relaxation. As a result, the population is getting more obese. In 2010, the Centers for Disease Control and Prevention (CDC) reported higher obesity numbers, counting 35.7% of American adults as obese, and 17% of American children. That’s a direct vulnerability to diabetes as stated above. Hence, finding ways to combat this trend such as with health games become all the more important. Video games appeal to a large chunk of population – youth and adult. As a result, they have a widespread reach and if designed meticulously can help change unhealthy habits in both kids and adults and drive them towards a healthy living. Currently, I am researching how can health games drive existing diabetic adults towards a better lifestyle, and how can they help them keep their diabetes in check. As a MBA student, we learned that habits need around 3-6 weeks to change. So to be effective, these health games need to be intriguing enough to sustain use for at least that time to affect changes in habits. We found a few games that are already out there, targeting an entire diabetic population per se. For E.g. the Diabetic Dog Game by BrainPop, is a game where you are a caretaker for a diabetic dog and you manage his health by looking after its food supply and medicines. It helps you learn more about how to manage your own diet and how each of the foods that you buy weigh in on your health, when is an insulin injection necessary etc. Another game is HealthSeeker, which has been developed by Ayogo Games in collaboration with Diabetes Hands Foundation, and Joslin Diabetes Center. It is a Facebook based game that encourages a user to use social media to play the game. The user sets his/her goals, and gets points and badges for completing them. The goals are set to promote healthy eating habits and regular exercise schedules. As is the case with all Facebook games, you can also invite your friends to play and challenge them to certain goals. Thus, it tries to foster an environment of competitiveness. There are also a slew of social wellness game firms relevant to “lifestyle diseases” like diabetes that are targeting the employer wellness market, like Keas, Limeade, Virgin Health Miles and OneHealth. Overall, a great learning experience for me as I go about researching the various health games in the market and learning more about diabetes. Being a donor to the American Diabetes Association for the past 4 years and someone who has seen a family member affected by diabetes, I can relate to a lot of these findings and that’s fuel to my research about Diabetes. I’m hopeful that our research efforts will translate into effective interventions for behavior change and chronic disease management via new games, tools and other methods. After a lot of thought and consideration, I finally chose to spend my summer as a Product Manager Intern with DrFirst. For those of you who don’t know, DrFirst is a Health IT company headquartered in Maryland and the developer of Rcopia suite of products, the leader in standalone e-prescribing software. Having worked in one of the largest IT services companies, Infosys, which is a highly organized and process oriented organization, it took me some teething time to understand how to work my way around at DrFirst. Once familiar with the people and processes, I was surprised to see how organized the firm was considering its relatively smaller size. The best part of working at DrFirst was that I got to interact with some of the sharpest brains around. The C-level executives were open to discussions and wanted me to look at the organization through a critical eye. My unending list of questions was answered during the daily morning meetings. People were very open to suggestions and on being questioned on why a process was done the way it was. My role as a Product Manager Intern required me to wear various hats including that of an end consumer, the executive management, the developer, the partners and the data providers. My past experience at product development and my understanding of the inner layers of the product came in handy at various stages as I was able to pinpoint the areas and the possible architectural pieces of the software that required improvement. One of the most exciting parts of my internship was being able to work on a new product idea. Because of the flexibility and space that I was given in the organization, I was able to use many of the concepts learned from my MBA courses and convert my ideas into a working prototype. I used an unconventional approach to product development methodology at DrFirst that they really liked. All healthcare companies are burning the midnight oil to migrate themselves to ICD-10, a new system of diagnostic codes. At DrFirst, I aggressively analyzed a vendor proposal and found that it was overcharging for the prospective migration. All resources for this implementation were freely made available online by National Library of Medicine (NLM). On another project, I defined a new market entry strategy plan. My knowledge about healthcare and the associated laws in this industry that I gained through working at Center for Health and Information Decision Systems (CHIDS) worked in my favor in all the projects that I worked for. Overall, I had a fantastic experience at DrFirst. In fact, they liked my work so much that they want me to continue working for them during the Fall 2013 semester. I was presented with a wonderful opportunity to work at Johnson & Johnson this summer for my MBA internship. Specifically, I was working at Ethicon in New Business Development (NBD) in Somerville, NJ which is now part of J&J’s Global Surgery Group. Most people would associate J&J with their consumer division, but an interesting fact is that the Medical Device and Diagnostics division has been the main source of growth for the company in recent years and makes up ~40% of the company’s top-line revenue. This was my first opportunity to work for a high caliber, multi-national company, and I was thrilled at what the next 13 weeks had in store for me. Throughout the summer, I was responsible for managing four main projects while also assisting with a variety of projects for the internal use of NBD which included preparing a financial comps analysis for quarterly review in addition to monitoring relevant industry transactions. ▪ Conducted research and presented on a billion-dollar white-space project in Interventional Lung Care which included building a comprehensive market forecast model to support primary market research. ▪ Developed and presented a strategic recommendation to a newly acquired medical device reprocessing company to support a new business model. ▪ Assisted with a financial model for the purpose of portfolio (SKU) rationalization. Throughout the summer, I was afforded several opportunities to interact with senior leaders from various operating companies in addition to having met the company CEO, Alex Gorsky, during a town hall meeting. My internship exceeded all my expectations, and I am fortunate to have been a part of the NBD team this past summer. The wealth of knowledge gained from my time at J&J will give me the confidence to apply these learnings to my work at CHIDS in the coming year and throughout my career. Patient care has been rapidly changing in recent years. Spurred by government attention and funding, smart people are flocking to the medical arena, focusing their attention on bringing the benefits of modern technologies to improve all areas of medical care. Some ideas causing these trends include Personalized Medicine, the evolving definition of the term “patient engagement”, new utilization of “Observations of Daily Living” (ODLs), mobile health apps, putting the care provider and patient “at the same eye level”, and smartphone physicals. Click on the links to read about these exciting new developments, and the people making these things happen. Smartphones, tablets, and related technologies are bringing ever-increasing functionality into the hands of medical professionals. Physicians are using apps that lasso disparate functions onto a single device, increasing productivity and efficiency, and apps that are helping them to diagnose maladies and make prescriptions more quickly. Apps bring new channels for communication between doctors and patients, monitoring treatments and keeping tabs on patient compliance. New tidbits of technological innovation are extending smartphone capabilities, from measuring vitals to ECG and EKG recording capabilities. Check out Future Health IT for these new developments. I have been researching quality measures over the last 2 weeks to support potential integration into a mobile app that may help with selection of medical services. An interesting question is how do patients select which hospitals to use. Do they pick the hospital they have experience with? Do they go to the closest one? And, with the availability of increasing amounts of information about quality, how is this affecting their choices? These are all questions that researchers are trying to answer. Unfortunately, there is still no single “correct” answer. Without making effective use of healthcare quality measures, patients are unable to make a rational choice. Studies have summarized some of the reasons that consumers use to choose a hospital: (1) they prefer hospitals that they have experience with or that their friends have experience with, feeling that they can get more trusted treatments; (2) the distance to the hospital is also a common reason. A large number of patients simply pick the closest hospital while few will make a trade-off between quality and distance; and, (3) Patient’s own previous experience with the medical provider can affect their choice of a hospital. Policy makers hope that by publishing information on healthcare quality, such as CMS does with the Hospital Compare website, patients can make more informed decisions. However, some surveys have shown that a limited amount of people use hospital quality information or find it relevant, while a larger portion of people are not even aware of the availability of this kind of information. Although people say they prefer to have as much information as they can, researchers have found that the availability of large amounts of data does not help consumers make better decisions. Patients are easily confused when they encounter too much information. They need guidance to understand the data in order to use this information in their decision-making process. Also, the guidance must be put in a relevant context for patients. Using a combination of surveys and focus groups, researchers have shown that patients poorly understood many quality indicators, and patients found little utility in these measures. However, if provided with the right context, patients can better understand the quality indicators. Another reason for consumers not making full use of available quality measures is that the available information is not the information they want. However, when asked about their preferences for information on quality, patients’ answers are consistent and can vary significantly based on how the question is asked or what information lead to it. Thus, we need to develop better approaches to seek the preferences of consumers and match that to quality indicators. This harkens to my own experience searching for quality measures. There are lots of quality measures, such as those at Medicare.gov, AHRQ’s Quality Measures Clearinghouse, and NCQA among others. Without appropriate guidance or a full understanding of the healthcare context, I had difficulty translating these quality measures into useful inputs for a patient decision-making mobile application we are exploring. Many of the technical terms were unfamiliar. Nevertheless, I now have a much better picture of the quality measure landscape and after discussing specific contextual examples with an expert, it was much more clear. It is important for the publishers of quality measures, especially the quality measures meant for patient consumption, to present quality measures in ways that patients can make the best use of them.